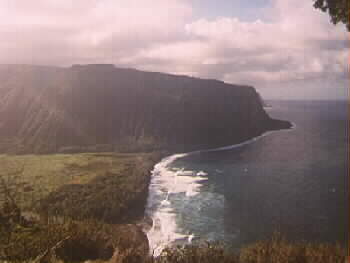 Waipio Valley is one of my favorite spots on the island and a must see spot for anyone visiting. 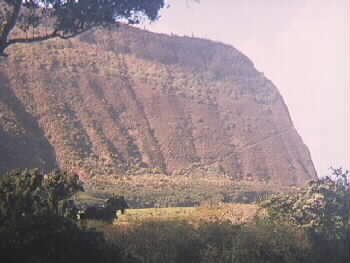 Located on the northern end of the island it is a beautiful valley which once was home to thousands of Hawaiians and was one of the favorite places for ancient Hawaiian Royalty. In 1946 a major tidal wave washed into the valley and destroyed virtually everything there, after this event most of the people moved out never to return. 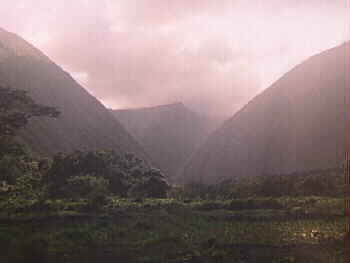 A few hardy souls still live here and tend to their taro farms, braving the frequent floods, lack of most utilities and a challanging road into the valley. Unless you have a 4 wheeled drive vehicle or a very sturdy pair of legs, the view from the lookout shown above is about all you can see, but it's still breathtaking. The real trip is down "the road" carved into the nearly vertical cliffs of the valley. The road drops about 900 ft. in elevation in less than a mile with grades as steep as 25%, that's the reason for the 4X4 only only rule, without the low gearing brakes will not stand up to the strain as a few twisted wrecks at the bottom will testify. Any way once you have made it to the valley floor a right turn along the river will take you to the mile long black sand beach. are some nice places to camp or have lunch. You can camp overnight, but you have to apply for a permit to do so. If it's been raining take a short hike up the beach to the right and you may see some very nice waterfalls cascading down the vertical cliffs into the ocean. If you take a 3/4 mile walk down the beach to the left it will bring you to the far side of the valley where the really adventurous can take the zigzag up the valley wall into the valley beyond. 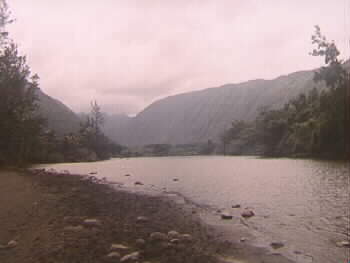 This next valley, known as Waimanu is uninhabited and beautiful. 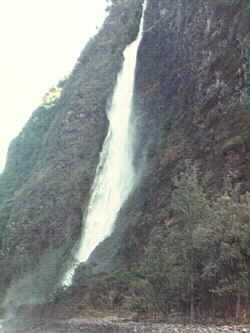 It was used to represent the mythical "dry land" shown in the movie "Waterworld" which was filmed mainly on the Big Island. Backtracking along the side of the valley from the beach the road criss crosses the stream between the fields of Taro, from which the Hawaiian food staple poi is made. Taro is grown in flooded fields much like rice. In some spots the so called road actually follows the stream bed for short distances it's all worth while though because the view up the valley is awesome. If you don't have access to a 4X4 vehicle, there is a tour company which has 4 wheel drive vans which will take you into the "must see" part of the island.